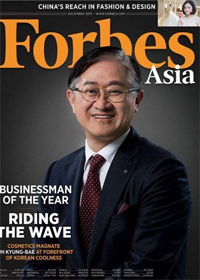 Singapore — Suh Kyung-Bae, Chairman and Chief Executive of South Korea’s largest cosmetics company AmorePacific, is named Forbes Asia’s Businessman of the Year in 2015. Suh is featured on the cover of the latest issue of Forbes Asia, available on newsstands now. The full story can also be found at www.forbes.com/asiabizman. Suh’s father founded AmorePacific and Suh took over the helm of the family company in 1997. AmorePacific was a successful but very local business, with nearly all of its sales in South Korea. Suh realized then that his Korean-centric company had to change in order to survive. He sold off businesses unrelated to cosmetics, expanded his product lines, and began setting up or enlarging operations around the region. Asia outside of South Korea and China surged 152% last year. personal care industry inched upwards by a mere 1.6%, according to market research firm Euromonitor. Analysts expect group revenue to reach $4.9 billion this year and top $5.8 billion next year. The company’s shares have skyrocketed 345% in the past two years. All that growth has made Suh upwardly mobile himself. He became a billionaire in 2011 and is now currently ranked as the country’s second-wealthiest person, with a net worth of $9.2 billion – 372% larger in just two years. A self-described introvert, Suh says relentless inquisitiveness propels him to take a detail-oriented approach to management. “I always try to learn things with the mind-set of a student as if I was back in school,” he says. throughout East Asia. That surge of cultural influence – known as “Hallyu” or the “Korean Wave” (K-Wave) – has buffed the image of the country and led to the positive perception of Made in Korea products. The K-Wave has been a tidal wave for the cosmetics industry. Asian women from Shanghai to Jakarta became mesmerized by the Korean stars they saw in dance videos and TV dramas and desired the same look – called K-beauty. that the phenomenon “did help us expand our business,” he prefers to claim credit for the company’s stellar performance. He stresses that his products are ultimately the source of his success. Despite its recent surge of growth, Suh is still working hard to transform AmorePacific into becoming a truly global company. Last year, the company’s revenue from outside South Korea was less than 18% of the total. His goal for AmorePacific stretches beyond Asia – to take on L’Oréal, Estée Lauder and other industry titans on their home turfs in the U.S. and Europe. For more information, visit www.forbes.com/asiabizman. Forbes Media is a global media, branding and technology company, with a focus on news and information about business, investing, technology, entrepreneurship, leadership and affluent lifestyles. The company publishes Forbes, Forbes Asia and Forbes Europe magazines, as well as Forbes.com and ForbesLife.com. The Forbes brand today reaches more than 80 million people worldwide with its business message each month through its magazines and 37 licensed local editions around the globe, Forbes.com, TV, conferences, research, social and mobile platforms. Forbes Media’s brand extensions include conferences, real estate, education, financial services, and technology license agreements.